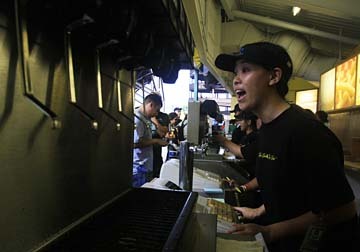 McKinley High School senior Jennifer Goo took a customer's order at one of Aloha Stadium's many Centerplate-run concession booths yesterday. The high school volunteers work the booths before, during and after the games, with a portion of the profits going toward the school's Project Grad. Jennifer Goo remembers one of the worst experiences while working a concession stand at Aloha Stadium: A man was yelling because he didn't want to wait for his french fries. "We had to refund his money because he was really impatient," the McKinley High School senior said. "That was a crazy time." While the experience may have been jarring, the McKinley students have also had many good experiences while volunteering at the Aloha Stadium to raise money for their senior Project Grad, a final all-night event on the evening of their graduation. They were working the Eisenberg gourmet steak franks stand. About 20 nonprofit groups like McKinley High School's volunteer at stadium sporting events selling food and beer at concession stands run by the stadium's food contractor, Centerplate. The groups receive 5 percent to 11 percent of the stand's sales, said Dara Barcelona, nonprofit coordinator. On a busy day that can equal nearly $1,000 for a group of 20. But the hours are long, with groups coming in at noon to set up and staying until after closing at 9:30 p.m. Many organizations commit to 14 events at the stadium, including high school events and bowl games. One group new to the fundraising effort is the Waikele Wildcats, a football team in the American Youth Football league. This season, the team won a spot in the championship game at the Rose Bowl in Pasadena, Calif., and is working to raise money to take the 60 kids, ages 9 through 14, and family members to the event. Head coach Claysen Young, also a construction worker, works the Gordon Biersch food stand as manager. "I love it," he said comparing the stand to running his football program. "I got to put the best people in the right position." Working the center cashier, Pumpkin Kealoha was dancing with the band next door during some down time. "Our goal is to raise as much money as we can to get our big boys there," she said. "This is a lot more money." Other nonprofits have been volunteering at the stadium for decades. Sadie Lew, 68, volunteers to raise money for the Kaimuki High School band. She's been working with the group at the stadium since her daughter was in the band in 1983. "I think it's better than going out to sell people things all the time," she said. The Kaimuki students were working for a trip to New York next year and raising money to help the band program buy instruments and music. "I try to think we gain a lot of friends. They're lifelong friends," she said, adding that it's a good way for parents to meet their children's friends.